October evenings this year are bereft of planets. Actually, at this point, serious astronomers will be laughing at me (together with some not-so-serious people) because the two outermost planets of our Solar system (now that Pluto has been relegated to the Championship) are in a very good position for viewing. However, Neptune and Uranus are only really visible through a telescope or by “star hopping” with some very good binoculars, so I tend to stick to the five bright planets. This is a good time of year though, to see our own galaxy, the Milky Way. Full Moon is on the 19th, so the first week or so should be a great time to start looking as long as the sky is completely free of clouds. If you have been paying attention, you will know that the Summer Triangle of stars is visible in the south, with Deneb and Vega high overhead forming the top and Altair lower down at the apex. 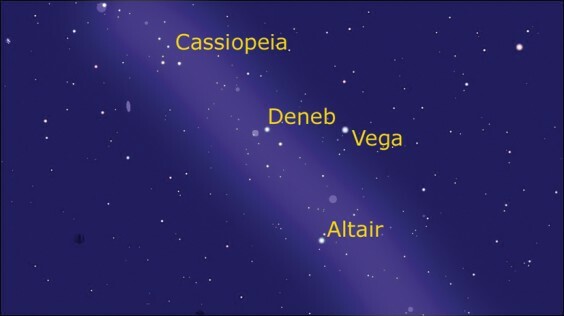 If you trace a line from Altair up through Deneb and onwards to the “W” of stars that make up Cassiopeia, you may be able to make out a misty, cloud-like streak across the sky. This is the Milky Way, formed of millions of stars, so numerous that they look like mist. You will need to find somewhere unaffected by street lighting but, fortunately, this is easily achieved around here, so the portion overhead can be seen (although you shouldn’t try looking for it as you walk along). Darker locations enable more of it to be seen, so if you spot a little old gentleman tripping over in some remote spot late at night, don’t worry. It’s probably yours truly seeking out new bits of an old galaxy. It will be worth getting up early to go planet spotting this month as Jupiter and Mars will be easily visible. Looking south at about five o’clock in the morning, the great constellation of Orion dominates the sky. Top left is the giant red star of Betelgeuse, and further left and higher are the twin stars at the head of Gemini. Jupiter shines out brightly in this part of the sky, easily identified as nothing else will be anywhere near as bright. It will remain in this spot as winter draws on, becoming visible earlier each night. Mars, on the other hand, is trying to get away from us as it orbits the Sun, and its daily movement across the sky is very noticeable. It can be found to the left and below Jupiter and, at the start of the month, to the right of the reversed question mark of stars that form the head of Leo. It’s not very bright but its colour should be noticeable. It will move, day by day, so that by the middle of the month it will be very close indeed to the brightest star in Leo, Regulus, at the base of the question mark. Look out for it on the 13th, when it will be just above Regulus, and just above that will be the comet ISON. You will definitely need binoculars to see the comet or, more likely, a telescope but this could be our first sighting, although next month is the time when it might get more interesting. After this close pass, Mars continues moving away from Leo and won’t be an early evening object for some months.